The last week has been awesome, culminating in the Klaar om te Wenden event with 900 people and an energy that this country will find hard to resist. What we pulled off could not have come out of the old ways of thinking and being—they told us so themselves! This was a test to see if we at the Center for Human Emergence were really serious about walking our talk and making it happen. I believe we passed with flying colours. Always more to learn of course, but now is a time for a major pat on the back, to stand proud and tell the story of this great step. One of things that dawned on me (in one of those bybaby-enforced early morning meditations!) about why we managed what we did, is around how we seemed to embody the concept of natural hierarchy. That is to say that people took on the things that they and others knew they could do best, beyond concerns about status and reward, with the good of the whole as the prime driver. 900 people show up for an experience in a converted factory with Dr Don Beck, Prof Ervin Laszlo, Herman Wijffels and Peter Merry as contributors. We blow the roof off the place and the Center for Human Emergence Netherlands is on the map. Now we have a responsibility to channel that energy. 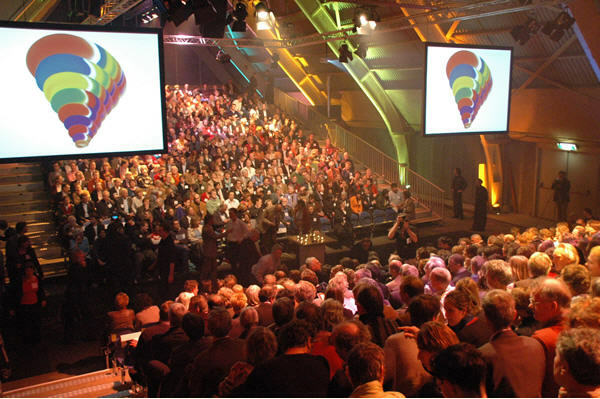 Talk in March 2006 at major public event about change in the Netherlands. Peter was speaking alongside Herman Wijffels, Prof Ervin Laszlo and Dr Don Beck. Klaar om te Wenden from Peter Merry on Vimeo.